High Quality Special Micro Beads for Fine, Normal, or Course Hair. Best, NO-Slip Micro Beads. Picture Shows Large Size Micro Links. 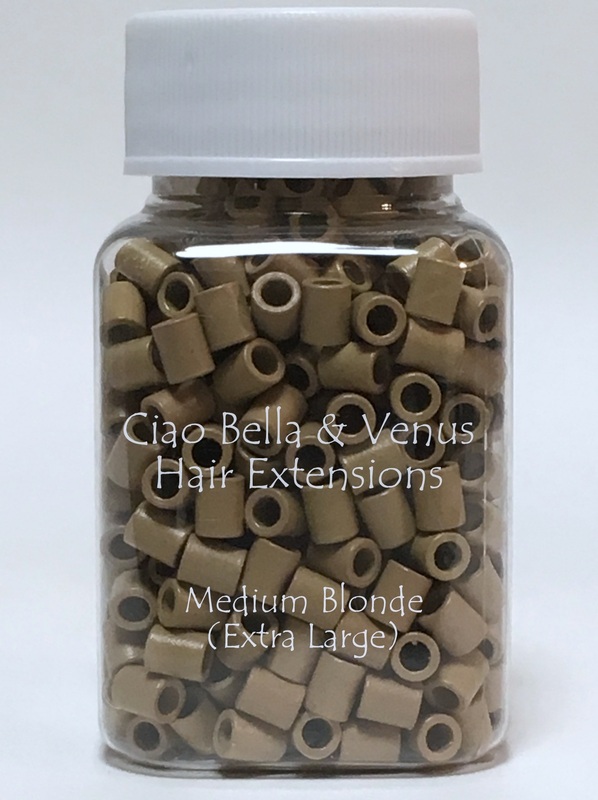 MEDIUM 2.7mm SIZE is 500 Pieces of Micro Beads (most popular size) for attaching our cold fusion stick type hair extensions. Perfect fit for attaching our stick hair on Normal, or Medium Hair. LARGE 3.0mm SIZE is 500 Pieces of Micro Beads for attaching our cold fusion stick type hair extensions. Perfect fit for attaching our stick hair on Course, or Thick and Dense Hair. EXTRA LARGE 3.3mm SIZE is 500 Pieces of Micro Beads for attaching our cold fusion stick type hair extensions. Perfect fit for attaching our stick hair on "Doubled" Strands. SMALL 2.4mm SIZE is 1000 Pieces of Micro Beads for attaching cold fusion stick type hair extensions. Perfect fit for attaching many "other brands" of stick hair. Note: Small Beads are too small for our brands of hair. Micro Links are easily attached using our Pulling Hook and Special Cold Fusion Bonding Tool sold seperately here.